October 14, 2010 - Garmin announced that they are working towards a Supplemental Type Certificate (STC) for reduced vertical separation minimum (RVSM) certification for installation of the G600 in select aircraft. The STC is expected to be completed early in 2011 and will initially be available for new G600 installations on the Cessna 441 Conquest II with an ARC 1000 autopilot. Once completed, Conquest II operators will be eligible to fly RVSM flight profiles at 29,000 feet through the aircraft?s max altitude of 35,000 feet. This will allow Conquest II pilots to gain fuel savings, reduce their vertical separation from 2,000 feet to 1,000 feet required for RVSM altitudes, and increase airspace capacity. 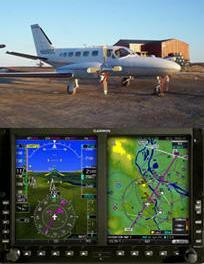 ?As the recognized worldwide leader in RVSM certifications, we were excited for the opportunity to team with Garmin on the Cessna 441 and bring to market an RVSM solution that delivers tangible flat panel benefits for the same price as a conventional altimeter-only RVSM solution,? said Dave Doucette, AeroMech vice president. ?Cessna 441 owners and operators would rather operate in RVSM airspace to realize the full design capability of their aircraft. The benefits provided include greater range and endurance, saving up to 26 percent in fuel burn at the most efficient altitudes and having the ability to fly above most weather systems resulting in far fewer turbulent encounters. It?s a great solution that we?re proud to be a part of and a winning combination for aircraft owners,? said Pete Tsaris, Corporate Aircraft?s general manager. These screens are mounted side by side in a single bezel that fits neatly into the ?six pack? slot of the instrument panel. The G600?s PFD shows attitude, airspeed, climb rate, altitude and course/heading information over a virtual terrain image with SVT, and the MFD displays detailed moving-map graphics of the aircraft?s current position in relation to ground features, chart data, navaids, flight plan routings and more. ?Many G600 operators are flying high-performance aircraft that can operate between 29,000 and 41,000 feet and they need the flexibility that comes with RVSM,? said Gary Kelley, Garmin?s vice president of marketing. ?The RVSM certification for the Conquest II with G600 will open the gateway for these aircraft to fly behind state-of-the-art flight displays and simultaneously operate their aircraft at these more efficient altitudes.? Installations of RVSM-compliant G600 avionics must take place at a Garmin authorized dealer. G600?s that are certified with RVSM will include the GDC 74B air data computer, altitude pre-select, and other required hardware, and pricing will begin at approximately $80,000.